Junior quarterbacks Johnny Stanton and Kurt Palandech continue to be locked in a tight two-man race for the starting job after they each threw costly interceptions. The UNLV football team played its second and final intrasquad scrimmage of fall camp that was open to the public on Friday morning at Rebel Park. 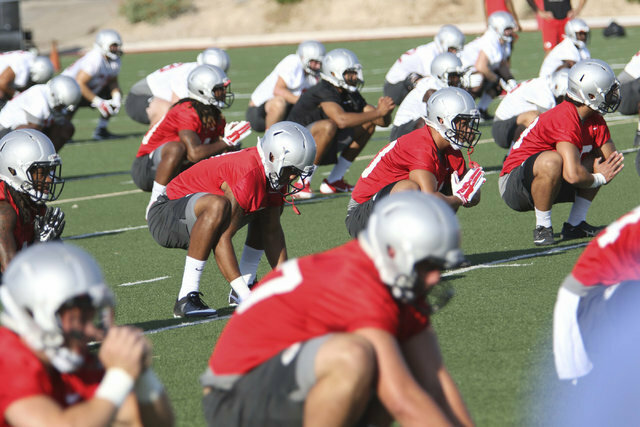 It was the 17th of 29 practices leading up to the Rebels’ Sept. 1 season opener against Jackson State at Sam Boyd Stadium. Junior quarterbacks Johnny Stanton and Kurt Palandech continue to be locked in a tight two-man race for the starting job after they each threw costly interceptions. Stanton was intercepted in the end zone and Palandech threw a pick that Darius Mouton returned 99 yards for a touchdown. UNLV coach Tony Sanchez said he expects both quarterbacks to play in the opener. “It’s one of those deals that if you need to let it play itself out and wait, then you wait. You don’t rush the decision, because the decision’s going to have a major impact on the season. Stanton started the scrimmage and missed an open Mekhi Stevenson deep downfield on the first series. He later led the offense to the 2-yard line when a pass intended for tight end Cody Scherff was tipped and picked off by Dalton Baker, a sophomore defensive back from Bishop Gorman. “The interception in the end zone is a quarterback’s mortal sin,” Stanton said. “You can’t have any ball security issues in the red zone and we had a lot of them today. In practice, we’ve been a lot better than that. Coach has been happy with us on ball security. Today we didn’t show that. We really took a backward step in terms of holding onto the ball. Palandech started strong, completing three straight passes early on to Brandon Presley, Darren Woods Jr. and Kendal Keys during a touchdown drive capped by a 2-yard run by David Greene. He later drove the offense to the 1-yard line before throwing the pick-six to Mouton, who raced across the field and down the sideline for the play of the day. “After I crossed about 30 yards, I was like, ‘Oh yeah. I’m scoring now,’” Mouton said. Said Sanchez: “I thought that Kurt played great. He was much better than (Saturday’s scrimmage). He just had one glaring mistake. Can we correct it? Absolutely. His eyes were in the wrong place. Instead of looking for the open receiver, he should have his eyes on the corner. Redshirt freshman quarterback Dalton Sneed had a 10-yard touchdown run during which he was hit by two defenders before lunging across the goal line. Sneed also had a 30-yard pass to Keys on another long drive that was halted by a goal-line stand from the Rebels defense.